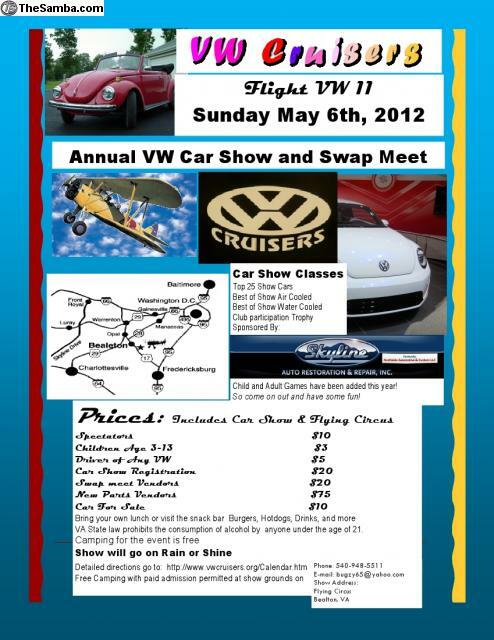 Flight of the VW 11, Show, Swap and CAMP!!!! Here's their info off the samba ad. Camping can began at 3pm on the saturday before the show, if u want to camp please Post up on the Facebook page or here. we will try to coordinate a club caravan on saturday for the camping and someone will coordinate it for club non campers on sunday. details to follow. Where else can you see vintage air-cooled and and stylish new water-cooled VWs along side vintage aircraft and WWII bi-planes? If you have never seen a Flying Circus Airshow it is definitely something to see! Air, water, customs, trikes, kit cars and dune buggies, it doesn't matter. Whether you own a Volkswagen or not, your invited. We are letting you the patricipants judge your favorite cars in the show! Free camping the night before w/ paid admission! We will be showing Herbie movies after dark on our 27 foot inflatable movie screen along with games for the kids and a bonfire complete with engine case! There will be showers available Sunday morning in the hangar for all that camp the night before. If your in the mood for something a little bit different in the way of VW shows, come on and check it out. You won't be dissappointed!